Many people have a strong passion for becoming a gunsmith. Perhaps their interest was sparked because they enjoy gun collecting or are a gun enthusiast. These people have developed a love for fixing up and maintaining guns. Interestingly enough, they can take their hobby and turn it into a career. A thorough background in woodworking, machining, and metalworking is just what is needed to get started. If you have an interest in designing, building, and repairing guns, a career as a gunsmith may be for you. When a gunsmith is hired to design and build a gun, they will meet with the client to determine their exact needs and wants. Then, they plan, build, and revise until the client is satisfied with the gun. Often gunsmiths are hired to repair a gun that is broken or to add parts and accessories. They may do jobs such as mount or fix a scope or change weapon to make it more accurate. The median salary for a gunsmith is $39,935. A gunsmith’s salary varies depending on their education and experience. Learning about the trade as an apprentice is one way to gain valuable skills and knowledge. They may also work for a large gun and firearm manufacturer and gain expertise and insight. Some courses are available that would go along with a higher salary. Gunsmiths work at various locations. They may work independently in their own shop, at a store that sells guns, or perhaps even at a sporting goods store. They setting in which they work will also play a part in the salary they earn. To get started on your career journey of becoming a gunsmith, you will need to learn some of the tricks of the trade. There are many ways this can be accomplished. In fact, your gunsmith journey may start as just a hobby in this field. This is a good way to help you learn the basic skills such as woodworking and metalworking. A solid background is math is also helping because you will be measuring and calculating. A basic knowledge of common hand tools used to sand, chisel, grind, and polish are very useful skills to learn. Courses in gunsmithing are available or you may want to learn by doing in an apprenticeship. Either way, you will need to learn about ballistics, writing, algebra, drafting, and woodworking. Some of these courses are taught at the high school level and at some technical colleges. Gunsmithing is a recognized apprenticeship program so you may find a place to work as a gunsmith’s helper. Any work whether part-time or even as an observer will allow you to learn the trade. You will learn why you need lots of patience and pay close attention to details. Some technical colleges and community colleges offer courses in Gunsmithing. It is possible to earn a diploma or an associate degree at these institutions. Programs may require as little as 6 months to earn a diploma or certificate or may require two years and culminate with an associate degree. Some non-credit earning courses are offered by the National Rifle Association. To become a gunsmith, it is very likely that any potential employer or educational program will require you to pass a background check. This check affirms that you are legally able to possess a firearm. Of course, this would also be a requirement to work on them as well. The U.S. Bureau of Alcohol, Tobacco, Firearms, and Explosives require that gunsmiths hold a valid Federal Firearms License if they build or sell firearms. In order to obtain a Federal Firearms License, the applicant must be 21 years old or older. Along with the age requirement, certain other legal and ethical conditions must be met. Additionally, some additional laws may require additional licensing in a specific city or town. When you have completed all necessary training and licensing, you are eligible to become employed as a gunsmith. Gunsmiths have a wide variety of places where they can work. Gun manufacturers, law enforcement agencies, and independently owned gun shops are just a few of the employment opportunities for a gunsmith. In order to become part of the gunsmith network, consider joining a professional organization made up of gunsmiths all over the country. This is an excellent way to meet others who are willing to share tips and craft information with you. Education as a gunsmith has several different pathways. 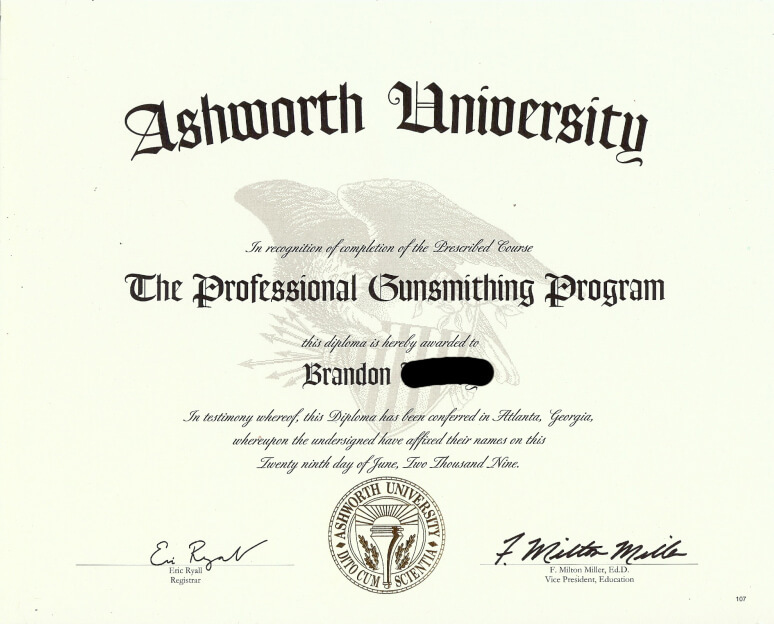 An individual hoping to become a gunsmith may attend colleges and technical schools across the country and hope to earn a degree, diplomas, or certificate. Regardless of the method you select for learning, proper education is the best way to get started on a successful career. A 6-month certificate/diploma gunsmithing program is available at many technical colleges. Many programs like this are available online. Student interested in gunsmithing can also obtain an associate degree at many colleges. These programs take two years to complete. The associate degree programs make sure you know and understand all the basics then they push you toward the expert level. Regardless of the type of program, the topics covered will be similar. Diagnosing firearms that do not function. Some education courses are offered by the National Rifle Association (NRA). These courses are short and do not provide any type credit. Perhaps the NRA courses would be a great starting place for someone interested in becoming a gunsmith. Education cannot be fully addressed without mentioning the benefit of an apprenticeship program. If someone who has worked as a gunsmith for many years will allows you to come and learn from him, you will be gaining valuable experience and knowledge not found in a textbook. If you plan to use your apprenticeship as an alternative to education at a school, applying for approval for your apprenticeship may be necessary. After approval, you must work with the gunsmith for a stated number of hours in order to earn your designation. Gunsmiths’ often take possession of firearms that belong to another person. Because of this change of hands, they must hold a valid Federal Firearms License. In order to have a FFL, the holder must be 21 years old or holder and provide information similar to the information given for a background check. The requirements for holding a Federal Firearms License are very strict. The gunsmith who has a FFL must prove that a separate work building is provided that is not a part of the residence. This building is where all gunsmith work is supposed to be completed. Before a FFL is issued, an agent comes to the gunsmith’s work area and inspects. He ensures that the premises meet the specified code. Additionally, he speaks with the applicant before granting the license. The questions asked during his interview ensure that you know and understand gun safety and that you know what you are doing with the firearms. Requirements state that the firearms must be kept in a locked area when not being serviced or repaired. Details of every transaction must be recorded for every firearm that comes into and out of the building. Gunsmiths are classified as metal and plastic workers for the purpose of statistics and comparison. The job outlook for those individuals who work with metal and plastic is about a 5% decline. While the traditional gunsmith career shows a potential decline in the next few years, job outlook looks better when considering different paths. Gunsmiths make great employees for gun manufacturers. A manufacturer will have an ample supply of firearms that have been returned for warranty repair. This would be a career path that would offer an opportunity for advancement into management or design. Gunsmiths could find their niche at the local law enforcement office. Government agencies need to repair and maintain firearms carried by officers. Finally, someone trained and licensed as a gunsmith may open their own business. They would serve the gun owners in the community as they customize and repair broken firearms and install other parts. That's a higher than average projected growth of 2,503 jobs. 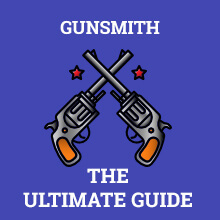 Should You Become a Gunsmith? Working as a gunsmith can be a rewarding career for someone who already enjoys creating and working with firearms. The activity that was once a hobby can now provide meaningful work and income. A gunsmith utilizes creativity and expertise in making specialized guns. Restoring a historic firearm to its former condition can be very rewarding. Developing expertise gives a gunsmith an opportunity to become an acclaimed expert in the field. Gunsmiths usually get paid hourly. The average pay is $15 per hour. The annual median salary for a gunsmith is $39,935. To enhance your career as a gunsmith you will want to specialize in making, repairing, or restoring certain types of firearms. When you develop your skills with a particular type of firearm, you can become an expert in this area. With added knowledge and skills, you will be able to ask for higher pay. Statistics show potential growth for this career at -1% to 1%. So, growth is marginal, but if you specialize or sharpen your skills, you can be one of the gunsmiths that are known for their skill and expertise. Individuals who work as gunsmiths may learn the trade as an apprentice working under the leadership and supervision of an expert in the field. An apprenticeship program is often an alternative to formal courses or education. Gunsmithing programs are available at technical colleges that usually last about 6 months. These programs culminate with a certificate. Associate degrees may be earned at some colleges and universities. To earn a degree in gunsmithing from a university will take two years. Q. What Is the Average Salary of a Gunsmith? A gunsmith earns $15.00 per hour. This results in an annual median salary of $39,935. Q. What License Is Required to Work as a Gunsmith? Because gunsmiths will take guns that belong to others into their possession, they must hold a valid Federal Firearms license. In order to obtain a Federal Firearms license, the applicant must be 21 years old and meet other legal and ethical standards. Additionally, prior to attending any gunsmith program or working as an apprentice, an applicant will have to pass a background check. Gunsmiths may not be a convicted felons. Felons are not permitted to possess firearms. Additional conditions on which an applicant may not pass the background check is domestic violence or restraining orders. Any person who has been deemed mentally unstable or has ever been admitted to an institution for mental health may not become licensed as a gunsmith. Q. What Is the Age Requirement to Become a Gunsmith? Gunsmiths must be 21 years of age or older. Q. How Many Hours Gunsmiths Work? A gunsmith typically works a 40-hour normal workweek (Monday through Friday). There may be times when a special project is due and extra work during the evenings of weekends is required. Q. What Is the Difference Between a Firearms Engineer and a Gunsmith? A firearms engineer identifies and corrects flaws in the design of exiting firearms. Often, a firearms engineer collaborates with the military to create firearms needed to meet their specific needs. A firearms engineer focuses on a the functionality of the firearm. A gunsmith is more of an artisan who enjoys the firearm and its history. A gunsmith focuses more on the creative aspect of firearms. If you can, find a spot in a large gun and firearm manufacturer and gain expertise and insight. But if you can’t, take the course, have a thorough background in woodworking, machining, and metalworking and you are good to get started. Courses in gunsmithing are available no doubt but I’ll always advise that one learn by doing an apprenticeship. Learning about the trade as an apprentice is one way to gain valuable skills and knowledge and it’s more practical. Oops. A solid background in math? That’s definitely not me. I’m not good with measuring and calculations. But I do have basic knowledge of common hand tools used to sand, chisel, grind, and polish. I hope I can still start somewhere.